You can’t turn on a sports channel these days without hearing his name or seeing his jersey . He’s the new moral standard of football in a time when there doesn’t seem to be any light at the end of the tunnel for the sport. And his background has formulated the man that teens everywhere choose to either love or hate. James Servansky, a Penn Manor senior, says he is now a Tebow believer. “He finds ways to win which is the most important thing he can do for his team. He is truly interesting to follow,” says Servansky. Some don’t support the new phenomenon. They claim to be unimpressed. Tim Tebow was born to American parents on a mission trip in Makati City in the Philippines. Prior to his birth, Tebow’s mother was told her child was going to be a stillborn baby and doctors advised her to have an abortion to protect her life. She did not agree. When the baby was born with a clean bill of health, Tim’s mother, Pamela Elaine, was relieved with her decision. She knew from the beginning that her baby would go on to accomplish great things in his life. Tebow displays his unorthodox throwing technique. Photo by Yahoo Sports. At Nease High School in Ponte Vedra Beach, FL, Tebow became a standout quarterback with uncanny courage and extreme competitiveness. During the first half of a game in his junior season, he suffered a leg injury. Tebow then went on to play the entire second half, including a 29 yard touchdown run, all on a broken fibula. Tebow was named Florida’s Mr. Football and was listed as one of the top 33 football players in Florida’s 100 year history of high school football. “He believes in something, always works hard, and never says anything bad about people,” said Penn Manor senior linebacker and captain Dylan Weber. Tebow then went on to shine at the University of Florida from 2006 to 2009. He led the Gators to a BCS National Championship victory and also became the first sophomore to ever win the Heisman Trophy in his time at Florida. In 2010, Tebow was drafted into the NFL by the Denver Broncos in the first round. The Broncos began this season with Tebow on the bench. After starting off to a dismal 1-4 record, Tebow was named the starting quarterback. The Broncos then went on to win 7 of the next 8 thanks in no small part to the fourth quarter play of Tebow. With a rating of 96.3, Tebow has the highest total quarterback rating in the final seven minutes of the fourth quarter in the NFL, according to ESPN. After the winning streak, the Broncos have ended the season with three consecutive losses. Tebow has been criticized heavily by many analysts for his throwing mechanics and his lack of accuracy. One opponent even called Tebow “A good running back” after being defeated by the Broncos. “He doesn’t deserve the criticism he receives,” said senior Alex Cummins. Tebow elluding Steeler defenders. Photo by Yahoo Sports. Others believe the criticism is fair. “He’s a mediocre NFL quarterback at this point,” said Dutchess. But the reality is that Tebow does what many quarterbacks only hope to do. “He reminds us that strength comes in many forms and some people have what can be described only as a gift for winning, which isn’t synonymous with any spreadsheet inventory of what it supposedly takes to win,” writes NY Times author Frank Bruni. 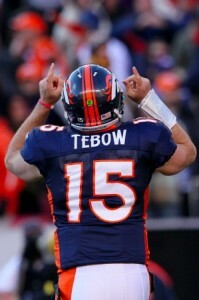 Tebow has flamboyantly expressed his religious views during the games and in press conferences. He has become famous for his act of ‘Tebowing’ or kneeling in prayer throughout the game. “I think he’s a little narrow minded with his religious views in terms of what he feels is correct. But on the flip side, most of his religious views aren’t really going against other major world religions in terms of large differences in belief systems,” said Dutchess. In addition to football, Tebow has been an active humanitarian and volunteer. According to the official website, “The Tim Tebow Foundation exists to bring faith, hope, and love to those needing a brighter day in their darkest hour of need.” The foundation’s website continues to say, “The Foundation utilizes the public platform that God has blessed Tim Tebow with to inspire and make a difference in peoples lives throughout the world.” This combination leads some to believe that he is someone to look up too. “As a role model, I think he’s great,” said Dutchess. 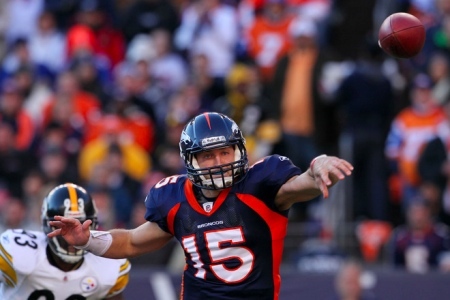 Despite their recent slide, the Broncos hosted the hometown Pittsburgh Steelers in the first round of the playoffs. The chances that the Broncos could end the losing streak seemed slim to Steelers fans at Penn Manor. “I think Denver has no chance of winning whatsoever,” said Dutchess. One student even decided to make a bold prediction. “The Steelers will win 21-7 and Tebow will have three turnovers,” said Weber. Tebow celebrating yet another victory. Photo by Yahoo Sports. Naturally though, Tebow did in his game against the Steelers what he does best: WIN. The Broncos dominated the first half of the game at the mile-high stadium in Denver. They held the Pittsburgh offense to six points, keeping then out the the endzone for two whole quarters. The Broncos managed to score twenty points in the first half, six of them coming from a classic Tim Tebow red zone touchdown run. The Steelers managed a comeback in the latter half of the game, however. With under a minute left in regulation, quarterback Ben Roethlisberger threw a touchdown to receiver Jericho Cotchery to tie the game and send it into overtime. Upon winning the coin toss, Tebow wasted no time finding the end zone to seal his first ever post-season victory. He connected with Demaryius Thomas for an eighty yard touchdown pass on the first play of overtime, ending the Steelers hopes of a Superbowl reappearance. The final score was 29-23 with the Broncos on top. Through his magnificent display this season and now his triumph in the playoffs (over one of the NFL’s top rated defenses), Tim Tebow has proved himself to be an extraordinary competitor in the sports world as well as a positive role model for anyone to look up to.